Time to start back in the shop for the fall and winter season and make something nice. Summer has been pretty busy, school is back in and all the vacations and trips are done, so time to get back to it. I decided a few months ago to make the three legged folding stool in Chis Schwarz’s “Campaign Furniture”. I like the campaign style and the idea of making stuff that fits on the back of an elephant or a camel on the way to the campaign in India. On the other hand, most mornings when I roll out of bed I am glad my campaigning days are over. I like teak wood chests with the brass corners and recessed handles and chairs that fold down into a packable bundle. The three legged stool in “Campaign Furniture” seemed a perfect introduction. I have wanted to try some leather work for a while. I like the look and smell of leather and I sensed it could not be too difficult. I checked with a couple of friends and they recommended a local branch of a national chain of leather suppliers. I took off one Saturday afternoon and found the store and bought enough leather to make two stools. The people at the store were very helpful and between the clerks and the book, I got what I needed. I cut some leg stock, ordered the three way nut for the center joint and in a few days had a beautiful little stool. I am real proud of it and actually found one like it in a hunting catalog the other day for $250. All this to say that my work for the fall will come from “Campaign Furniture”. 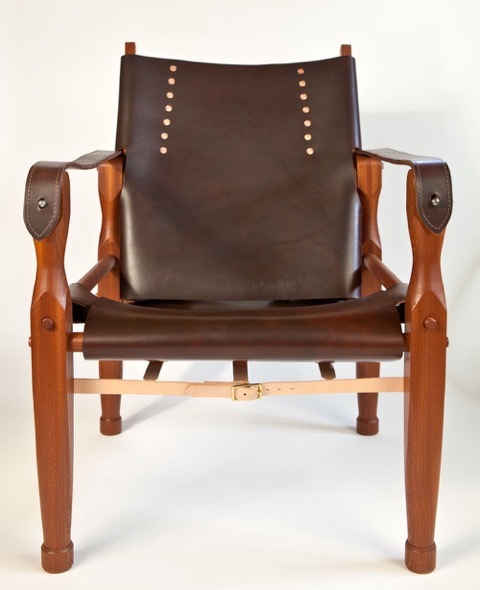 The Roorkee Chair is particularly fascinating to me. I love the legs and the leather and the straps and the buckles and the shape. I sat down today and ordered all the buckles and the brass screws and the knobs it takes to build two chairs. Next week I will head back over to the leather company and get a shoulder or a half hide so I will have all the leather I need for a couple of chairs or at least one chair and some screw-ups. Here’s a picture from Chris’s Blog about making the chair. Buy his book, check his blog at blog.lostartrpress.com, and bow down to someone who is bringing back a beautiful chair. After the Roorkee, there is a folding table, a strong trunk, a traveling secretary, and a folding bookcase. After that, it will be time to call the travel agent and book the camel caravan to Sudan and Egypt. What are you making this fall and winter? Would you mind posting the name / contact information for the leather suppliers? Thanks! Thanks for reading the post. I found a Tandy Leather store not far from where I live near the Atlanta Airport. My local store is in Lithia Springs just west of Downtown Atlanta if you happen to live in the Atlanta area. They have branches all over and I’m sure you can find one near you or you can order what you want off their web site. For more information, look at the blogs Chris puts up at Lost Art Press. 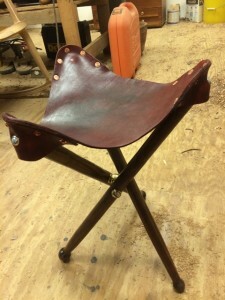 Search for “Roorkee” on the blog and one of the items which pops up is a listing of all the hardware and leather suppliers he uses to build his chairs. 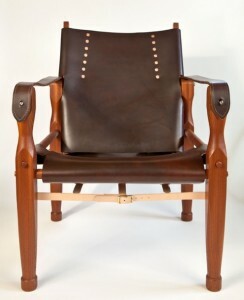 We have more posts coming next week as I travel through making this chair.